Sit back and relax as you enjoy your luxury coach transfer from Ayers Rock Resort to Kings Canyon Resort. 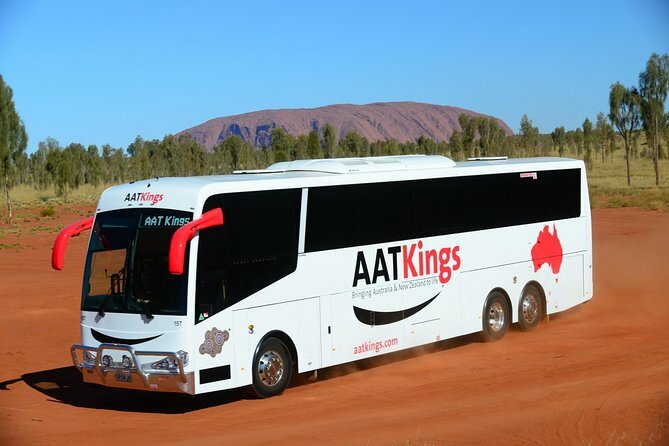 Travel by luxury coach through spectacular desert scenery from Ayers Rock Resort to Kings Canyon Resort. Pass through Curtin Springs cattle station before viewing flat-topped Atila (Mt Conner) in the distance. After turning off the Lasseter Highway and onto the Luritja Road your Driver/Guide will provide informative commentary about the history of the surrounding cattle stations. After you arrive at Kings Canyon Resort there may be time to view the sun set behind Carmichaels Crag, or attend the award winning ‘Under the Desert Moon’ dinner, exclusive to Kings Canyon Resort (own expense).